If you want a cookie that stays moist and chewy for days – even a week! – this is the cookie for you. Rich and spicy, they are perfect for cold rainy days or cool summer nights and they pair perfectly with grapes and cheeses and an orange-spice herbal tea or that favorite dry white wine you only pull out for special occasions. This cookie is known as Molasses Crinkles and it is indeed magical. This is a cookie my mother used to make all the time and still does. It is from the original (first edition, published in 1950) Betty Crocker Cookbook – I do not think later editions have this recipe in it. I know the edition I bought in the late 1990’s does not have it – or many of the other wonderful recipes that are in this book! If you can find one, I highly suggest you beg, borrow, buy it or steal it! No kitchen witch should be without this basic text. Molasses Crinkles are very easy to make. As with all recipes, get out everything you need before you start. Chill dough. Preheat oven to 375 degrees. Ready a small bowl of white sugar for dipping. After an hour or so, bring the dough out of the fridge & roll into balls the size of walnuts. Dip the tops into sugar. Place each ball, sugar-side up, onto a greased baking sheet about three inches apart. Bake until just set but not hard, 10 to 12 minutes, depending on your oven. Makes about 3 or 4 dozen cookies. Put into a container with a tight lid and these cookies will stay soft and chewy for over a week! Honestly, these look so good, I want to eat them right out of the picture! You HAVE to try these! They are TRULY magical! Until next month, this is Polly Applequeen the Kitchen Witch. Bon Appetite! I have been studying and practicing the skills associated with the Pagan and Wiccan religions for over thirty years now. My Book of Shadows, once a small spiral notebook, has grown to three large notebook binders, organized by subject and carefully maintained. Much of my information was copied from library books but nowadays I am more likely to print directly from the internet. I am a fairly eclectic witch – I live with the seasons and work to develop my divinatory skills – as a solitary, my rituals are very quiet and quite Zen-like in their simplicity. I am also unapologetically Dianic and see no reason to invoke a male god. Like my BOS, my personal culinary notebook has grown from a slender binder to two large binders with pockets for recipe cards. I collect cookbooks and read cooking magazines and have more subscriptions to cooking blogs than I really have time to read. Like so many of us magical people, I am a kitchen witch – I grown my own herbs and I enjoy my time in the kitchen. The holidays are my favorite time of the year. Starting with Samhain and ending with Twelfth Night, it is a time to feast with family and friends. Many of us have specialty recipes that we only cook this time of year. “Heirloom Holiday Cutout Cookies” are what I call a recipe that has been in my family for generations. In my personal cookbook, the name is “Christmas Cutouts” but I have been changing names of cookies to reflect a more multicultural bias. Anyway, these cookies are a rich butter cookie – the very best cookie of its kind. I insist that you only use butter – not margarine and not shortening. And use whole milk. And real vanilla. It makes a big difference. Also, make sure all your ingredients are at room temperature before you start mixing them together and that your butter is truly soft. Cream together butter & sugar until smooth. Add eggs & beat well. Add vanilla. Mix together dry ingredients in another bowl. Add to creamed mixture alternately with milk. Chill dough several hours. Roll out to desired thickness & cut, using cookie cutters. The fatter the dough, the more cake-like the cookie. 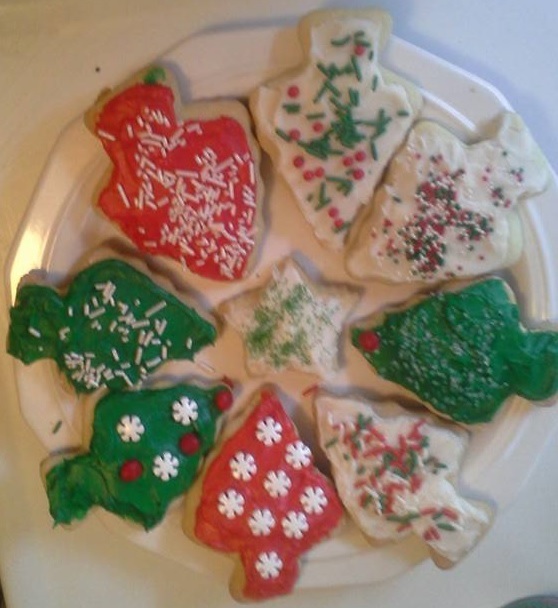 Also, the fewer cookies produced. Frost cookies with Buttercream Frosting (below) & decorate as desired. THE MAGIC OF A SONG AND A BISCUIT! September, ahhh, I love it! Crisp autumnal walks in the fading sunshine, crunching of leaves and nut husks underfoot and the hedgerows bedecked with scarlet berries. This is my all-time favourite time of the year. Of course this has absolutely nothing to do with the peace that descends over the land as the children are once again contained by the walls of the school, yay! The colours of autumn can quite take your breath away, here in magical Wiltshire it is glorious as the fields are stripped bare and the chaff is singed down, the trees explode into a riot of uplifting and comforting hues…and all of us that walk this path rejoice in the second harvest, Mabon. The equinoxes are literally a time of balance, once again as the wheel of the year turns we stop and take a moment to celebrate and give thanks, and this is our biggest thanksgiving festival of all. The light and dark are at that now poised on the edge of change once again, signalling for us to stop and take stock. I love that we have these points on the wheel of our year, it’s so wonderful to be reminded every 6 or so weeks to pause, take a breath, and ready ourselves for the next chapter…bit like a coffee break in the calendar! Ummm, biscuits, see how my mind wanders, it’s amazing that I ever get past the first sentence of anything I write! Where was I? Oh yes, biscuits…nope, oh yes… Mabon!!! Now I know we really aren’t at the sowing time of the year, and we are reaping the harvest now, and so we have technically already done that line in the song this year, but I think that sowing the seeds of magic that slowly grow through the dark half of the year means a stronger harvest when it eventually comes but maybe we should now sow a seed of magic to reap in the future…Which of course, if you know me and how my brain works brings me back to, yes you’ve guessed it, biscuits! Time to get those aprons on guys and whip up a batch of yummy seasonal biscuits, which a little magic thrown in of course?! Elderberries are so underused unless they are in Jams, jellies and cordials so get picking these gorgeous plump gems whilst they are in season, how convenient that the season runs from now to just before Samhain, making these little guys perfect for our Mabon recipe. Don’t forget to check the Hazel for any nuts too, it’s always a race to beat our squirrel friends to their nutty goodness, but hey, maybe this year is my year to win! Remember as ever, if you forage for your ingredients, leave plenty for our wild friends, take only what you need. Place the butter in a saucepan and melt gently over a low heat. I stir for positivity, light and love for all. Continue to whisk until smooth. Wheat of the earth, bind this spell for me. Fruits of the earth, seal this spell for me. Light of the goddess, please bless this spell for me. Leave your bowl next to the candle for 15mins to bless the work you have done. After 15mins has passed, drop tablespoons of the mixture onto a lined baking sheet, leaving room to spread between cookies. Place in the oven and cook for approx. 10-15mins (remove when just golden brown. Allow cookies to cool slightly on the tray before moving carefully to a cooling rack. You can dress these cookies up by drizzling the top with a little white chocolate if desired or change the flavour by adding a little orange or lemon peel. Ok, now you have your wonderful cookies, time to reap what you have sown my lovelies! Sown with love, all is well! Then take your cookies and give them to someone! A neighbour, a nursing home, a homeless person, anyone you wouldn’t normally interact with on a daily basis. Give them with love and blessings, with a smile as warm as the sun and a heart full of golden light. Your spell is complete my lovelies…and you will find you WILL reap what you have sown, the dark half of the year awaits with its many blessings, haven’t we got off to a good start!!! Of course once you’ve completed your spell you should really make some more, you know, just to check they are ok hehehe…it would be rude not too, I’ll put the kettle on, cuppa??? Now is the time to hit your farmer’s market to enjoy the Sun’s hard work! We are coming into summer squashes, corn, tomatoes, lettuces, cucumbers, peppers, as well as berries, citrus fruits, and melons. This is also a great time to indulge in some local wine or any frilly, fruity drinks. To honor the Sun, you can choose foods that are the colors of the sun–yellow, white, orange, and red. Cooking over an open fire or grilling tap into the Sun’s heat energy. Sun-dried foods also work in the same way. Spicy foods are also perfect for this time of year. 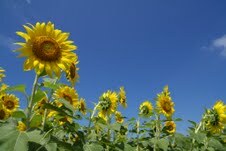 One flower stands out as a mirror image of the sun, the sunflower. With its radiating yellow petals and sky high stems, it is easy to see the resemblance. These cookies are a great crunchy treat and pack a nutritious punch. 2. In a large bowl, combine 2 cups flour, 1 tsp lemon zest, 2/3 cup (10 Tbsp + 2 tsp) chilled and cubed butter, 1 Tbsp honey, and 1 egg. Dough will be dry. 3. Knead by hand, or on low setting, until smooth. Wrap and chill for half an hour. 4. In a saucepan, heat 2½ Tbsp butter, ¼ cup honey, and 2 Tbsp cream over medium heat. Stir in 1¼ toasted sunflower seeds. Set aside and cool. 6. Place on lined sheet pans and top with 1 tsp of the seed topping. 7. Bake for 12-15 minutes until golden brown. If desired, top with lemon zest while still hot. You can use any cookie cutter you like, but sunburst cutters are widely available. In a pinch, use a juice glass to cut round cookies. If you don’t like sunflower seeds, no problem. Bake off the cookies sans topping. When cooled, decorate with a simple icing by mixing powdered sugar and lemon juice for a bright variant. Depending on the size of your cookies, you should get 3-5 dozen. That’s plenty for your Summer Solstice celebration! Merry Meet and Blessed Yule and Litha… I have been remiss in remembering that these pages may not only be seen in the Northern Hemisphere.. so as of the next issue I will be adding information for the opposing Sabbat so that those of you in the Southern Hemisphere will not feel abandoned. Sometimes you do not always remember that WWW really is The WORLD WIDE web..
Place lid on top. Cut an 8-inch circle of fabric to cover lid. Place fabric over lid; secure in place with a rubber band, then ribbon or raffia. Decorate as desired. Note: When measuring brown sugar, crumble it between your fingers for uniform texture. Be sure to pack the brown sugar firmly in the jar to prevent the baking mix from sifting down through it. Make a gift card to attach as follows: “Empty contents of jar into medium bowl. Stir in 1 stick of butter or margarine, melted; 1 egg, and 1 teaspoon vanilla until well combined. Shape into 1-inch balls. Place on baking sheets coated with cooking spray. Bake at 375 degrees for 1! 0 to 12 minutes or until cookies are light golden brown. Substitute almond extract for vanilla in cookies containing almonds. Add all ingredients to a large sauce pan, except for the Vanilla, Peanut Butter, and Oats. Bring to a boil. When melted turn to med. heat and add the Vanilla and Peanut Butter. Remove from heat and add Oats. Be careful not to add too many and make the mixture too dry. But you don’t want it runny either. Drop by tbsp. on waxed paper or aluminum foil. Let cool and set before eating. Mix together the flour, baking powder and baking soda. Set aside. Layer ingredients in order given in a 1 quart “wide mouth” canning jar. Press each layer firmly in place. It will be a tight fit. Add chopped peanut butter cups last. 2. Empty remaining cookie mix into large mixing bowl. Use your hands to throughly blend mix. 7. Bake at 375 degrees F (190 degrees C) for 12 to 14 minutes until edges are lightly browned. Cool 5 minutes on baking sheet. Remove cookies to racks to finish cooling. Mix together the flour, baking powder and baking soda. Layer ingredients in order given in a quart size wide mouth canning jar. Press each layer firmly in place making sure you really pack it down before you add the flour mixture, it will be a tight fit but it will work. 1. Empty cookie mix into large mixing bowl. Use your hands to thoroughly blend mix. 2. Add 1/2 cup butter or margarine, softened at room temperature. DO NOT USE DIET MARGARINE. Add 1 egg, slightly beaten, and 1 teaspoon vanilla. 3. Mix until completly blended. You may need to finish mixing with your hands. 4. Shape into walnut sized balls. Place 2 inches apart on a parchment lined cookie sheet. DO NOT USE WAXED PAPER. 5. Bake at 375 degrees F (190 degrees C) 13 to 15 minutes until tops are very lightly browned. Cool 5 minutes on baking sheet. Remove cookies to racks to finish cooling. 1 gingerbread boy-shaped cookie cutter Use a clean 1 quart jar and press each layer down firmly. Put in half of the flour along with the baking powder and baking soda. Add the spices and the remaining flour. Add the brown sugar last. Tie a ribbon around the top of the jar and attach the cookie cutter and the directions below. Empty jar of cookie mix into large mixing bowl. Mix thoroughly. Mix in 1/2 cup softened butter, 3/4 cup molasses and 1 or 2 eggs. Mix until completely blended. Cover and refrigerate 45 minutes. Preheat oven to 350°F. Roll dough to 1/4 inch thick on a lightly floured surface. Cut into shapes. Place cookies on lightly greased cookie sheet about 2″ apart. Bake 10 to 15 minutes. Decorate with icing. Preheat oven to 355 degrees. In a large mixing bowl on low speed, cream together butter and eggs until smooth, adding one egg at a time. Add the snickerdoodle mix and continue to beat mixture until a dough is formed. Combine the sugar and cinnamon in a small bowl. Shape the dough into 1-inch balls and roll in the cinnamon-sugar mixture. Arrange on ungreased cookie sheets 2 inches apart and bake for 16-18 minutes. Cool on wire racks. down well after each addition and attach a tag with the instructions. 2 Preheat oven to 350 degrees F (175 degrees C). Grease cookie sheets. them 2 inches apart onto the prepared cookie sheets. Makes 4 dozen ( 48 servings). 350F for 6 to 8 minutes. instant coffee granules, vanilla extract, flour and chopped pecans. from oven and cool completely on a rack. Make your mark with coffee-flavored cookies. The shape is classic. mixer on medium speed, or mix with spoon, until creamy. Stir in flour and salt. do not press all the way to the cookie sheet. sheet to wire rack. Cool completely, about 30 minutes. chips until melted. Stir in liqueur. Cool until thickened, about 10 minutes. each cookie with 1/4 teaspoon crushed candies. Divide dough in half (or sixths). Chill 1 hour. Roll out half of dough 1/8 to 1/4 inch thick. Use greased cookie sheet. Bake at 375 degrees Fahrenheit/190 degress Celsius for 12 minutes. These can be frosted. Makes about 5-6 dozen standard-sized cookie cutter shapes. chocolate and peanut butter cookies. speed, or mix with spoon. Stir in flour, baking soda and baking powder. about 2 inches apart on ungreased cookie sheet. Mix together butter and confectioners sugar until smooth. Stir in 1 1/2 cups flour. Press this mixture into an ungreased oblong baking pan (13X9X2). Flatten evenly. In the meantime, combine remaining ingreadients; mix well. Spread over baked crust in pan, and bake for 20 minutes. I know that this is a large list.. but it is actually been pared down some.. please feel free to share and have a cookie for me..